In the fall of 2008, I began planning a "cold-weather" open housefor my garden railroad. Lighting the buildings would be an important part of getting ready. Getting three buildings that a friend had prewired for lighting on his own railroad gave me some ideas. Soon I had found some twelve-volt sockets and bulbs I could use on my buildings. But how to connect them? The same company that sold me the sockets cheap offered to sell me 18-gauge lamp cord for 18 cents a foot. Not that long ago, I was getting the same cord from another vendor at a nickel a foot. I know the price of copper has gone up, but I had a sense I was being gouged. It so happened that I was also decorating my railroad's conifers with "mini-lights," the ones that say "if one light burns out, the rest stay lit." Several of the strands I tried using had shown the truth of that statement, but I hadn't pitched them yet because I was using lights from the obviously bad strands to try to fix the potentially salvageable strands. Then it occurred to me. 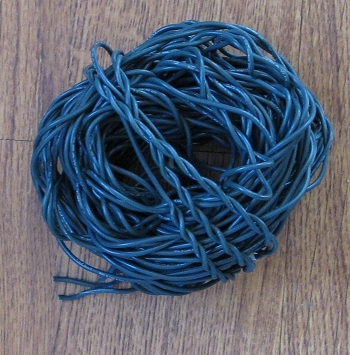 Here was a source of 22-to-24-gauge wire that was green and meant to be used outside, at least for a while. 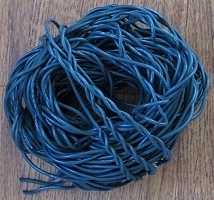 And it would reduce the amount of copper winding up in a landfill when I did pitch the strands. 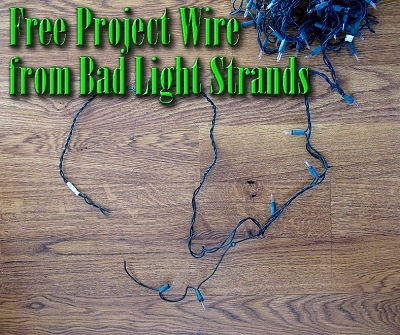 If you have the cheapest possible "mini-light" strands (the kind without a plug at both ends), you'll discover that you have a bunch of short wires connecting all of the sockets in a series and one long wire to bring the current back. Although the long wire on these sets is probably a very light gauge, it's still useful for low-voltage lighting projects indoors and out. On the other hand, if you have a 50-bulb "mini-light" strand that has a plug at both ends (for plugging multiple strands together), there will usually be two long wires, in addition to all the short bits connecting the sockets. The long wires carry the 110 volt electricity between the plugs. To recycle the long wires on a 50-light strand, it's only necessary to clip the plugs off each end and to clip the light sockets off. The little wires connecting the light sockets will pretty much fall out as you work and you're left with two long strands. 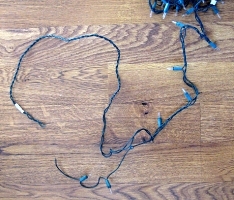 The remaining strands may not be the same length, as one of the long wires usually starts at the first light socket, while the other one goes all the way from one plug to the other. Since a better-quality 50-light strand is usually at least 12 feet long, that still gives you a very useful length of wire. 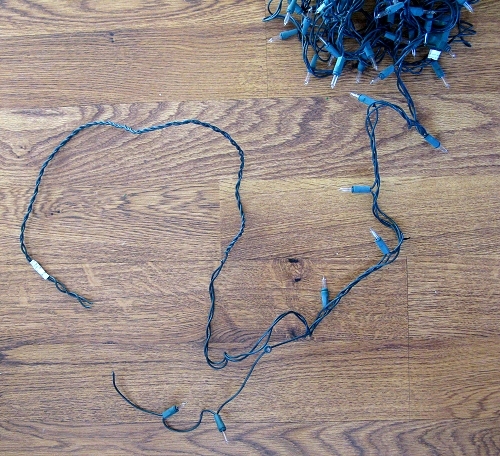 Longer strands, such as 100 or 150-light strands, are usually made up of two or more 50-watt strands wired in parallel with each other (that's why it's common for half of a 100-light strand to go out). On those strands, at least one of the long wires will only go half-way, and another wire will start up and go to the end of the strand. You may wind up with one 23' strand and two 12' strands, but that's no problem either. If the strands are tightly twisted together, as they often are on the better strands, I'd just as soon leave them twisted together. So from a 100-light strand, I get two 11' or 12' strands of a sort of "twisted pair" moisture-resistant wiring. And I keep that much copper and vinyl from going into a landfill. By the way, it's impossible to manufacture light strands cost-effectively without some lead sneaking into the process. So remember to wash your hands with soap when you're done working with them. Philips has introduced light strands that are supposed to REALLY stay on if one bulb burns out. (At the 2008 after-Christmas sales, I bought a few to try out next year, so we'll see.) If mini light strands start holding up as well as their advertising claims, you might not have as many to salvage each year. This year I salvaged enough wire from a few bad strands to light two downtown districts of my garden railroad and have 30' or more left over. Cost-wise I only saved a few dollars, but I got the emotional reward of "beating the system" and "saving the planet" at the same time. In case you wondered, I did try to find someone who would recycle mini light strands, but could only find one company, and I'd have to mail the strands to them. Maybe by next year someone local will recycle strands, then I won't have to feel bad about the bits I am pitching. Based on experience, at least three of the remaining strands I used this year will be bad or at least flaky next year when I try to re-use them. So I'll probably have the project wiring I need for the foreseeable future. Please let me know if you can think of ways to reduce, re-use, and recycle, while benefitting your hobby at the same time. When I wrote this article, I included a notice that with LED light strands supplanting incandescent strands, and some incandescent strands actually improving, light strands might start lasting longer. This would reduce the availability of this resource. Not to worry. Although LEDs themselves last longer than incandescent lights, the light strands they're putting them in are even more cheaply made than the light strands they used to use for incandescent, including iron contacts instead of copper. So if these light strands get wet outside or are stored in a damp place, they don't even last as long as the incandescent strands. Which means that this source of "free wire" will exist indefinitely. The colors are brighter and they don't fade. They take a lot less voltage. In my case, they probably reduced my Christmas lighting bill by about $100 a month. That's not a lot, but it certainly paid for the difference between the LED strands and the incandescent strands I would have bought anyway. You can connect more strands end-to-end. I usually avoid doing more than three strands end-to-end for my own sanity's sake, but if you have a 100' fence row or something, it's a distinct advantage. That said, don't bother buying LED strands because they are supposed to last longer. They don't, unless you use and store them someplace dry.